The Brexit vote sent a shockwave through the political establishment and as the dust settles, its message for HS2, “HS3” and the Northern Powerhouse is emerging. 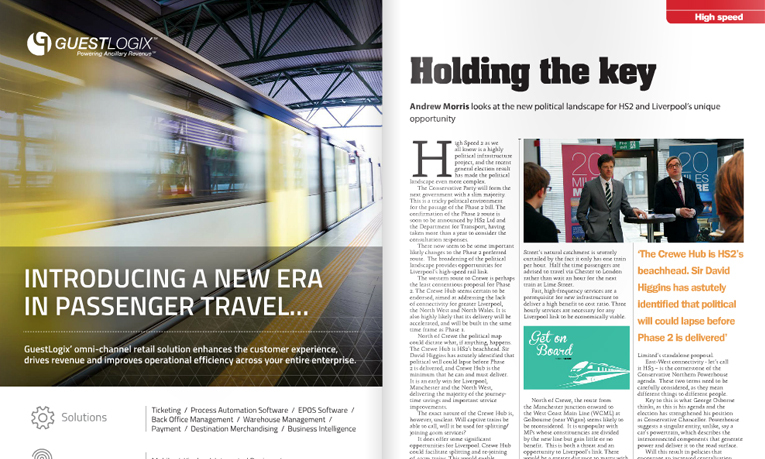 Now is the time to invest in a transport network that uses HS2 to irrigate the regions, not drain them, says Andrew Morris, Chair of 20 Miles More. In the thirty years since the Big Bang deregulation of financial markets, “the City” has become the de facto centre of international financial markets. Successive governments have become increasingly mesmerised by its charms, to the exclusion of the rest of the nation. London generates great wealth, producing as much tax revenues as the next 37 largest UK cities together each year . That wealth is highly concentrated in London and has created a dangerously imbalanced economy. It is difficult to find another major country that is so economically imbalanced. Canada, France, Germany, Italy, The Netherlands, Japan, and Spain have multiple wealth-creating cities. Whilst in the UK only 6 companies in the FTSE 100 are based north of Birmingham, down from 10 in 1984. Currently, London is the not just the economic centre of the UK, it is also the legislative, judicial, media, cultural and transport hub – despite being tucked way in the south-eastern corner of a long, narrow island. The blinkered focus on London has led to a mindset that everything of any importance is there, and the corollary that if it’s not in London it’s unimportant. The North of England has suffered in particular over the last 30 years. It has been strip-mined for assets by the City. High-value industries have been subsumed into London or sold off to the highest bidder. The North’s world-leading industrial companies were just an opportunity to realise their breakup value. Patents and products bases were sold off by corporate raiders to foreign rivals as the companies were starved of finance. Transport investment is an area of inequality that stands out. More money will be spent on one London project, Crossrail, than all of the transport projects in the North of England put together. This investment chasm urgently needs to be bridged and high-speed rail is one policy that should be amended to achieve this. HS2’s major deficiency is its London-centricity. There is only one hub on HS2: London. The three other cities on HS2 are branches off the main line. It is a hierarchical design from a bygone era, not an interconnected network for the information age. Sir David Higgins was quick to recognise this when coming onboard HS2 Limited . How high-speed rail should serve the North needs to be redressed. “HS3” must go beyond a command-and-control solution connecting just two points in the North to London. High-speed rail needs to mesh together the great cities of the North and to connect them with the Birmingham and London, and onward to Edinburgh and Glasgow. It is imperative that a route map is planned, leaving no doubt about all future destinations for potential investors, business planning and city development. 20 Miles More proposed a solution to solve this problem in January 2014 . By adding just 20 miles more of high-speed track, the largest city not on HS2, Liverpool, can be linked. This route would run west to east from Liverpool to Manchester connecting to the HS2 route. Not only would this boost the business case for HS2 by £8bn, it would form the first phase of an “HS3” network extending from Liverpool and Manchester to Bradford, Leeds, Hull spanning the North. The Brexit vote has been a rude awakening for the political establishment. The public has voiced their anger with the status quo. The shock result wasn’t just about the settlement between the UK and the EU but also the settlement between metropolitan London and the rest of the country. The Government needs to address this sense of alienation with policies that will rebalance an unstable economy and build the nation’s wealth across the Nation. High-speed rail can benefit the North, but HS2 needs to be adapted to do so. With the Chancellor’s autumn statement approaching we have reached a key turning point, will HS2 irrigate the North or drain it? On 30th November, the Government announced that HS2 would be extended to Crewe six years earlier than originally intended. The initial plan was for HS2 to open in two stages: Phase 1, London – Birmingham to be completed by 2026 and Phase 2, Birmingham – Manchester/Leeds (the ‘Y’) by 2033. The revised plan is for the first section of Phase 2, from Birmingham to Crewe, (Phase 2A), to open one year after Phase 1 in 2027. The remainder of the Y to Manchester and Leeds (Phase 2B) will open in 2033 as previously planned. On the opening of Phase 1 in 2026, an HS2 passenger service will be introduced between London and Birmingham using dedicated ‘captive’ trains. ‘Classic compatible’ services (HS2 trains capable of travelling on the conventional rail network) will be introduced between London and the North West and Scotland. These trains will travel at the HS2 linespeed of 360km/hr (230mph) as far as Lichfield, north of Birmingham, where they will switch to the classic West Coast Main Line (WCML) and proceed at conventional speeds to Crewe, Liverpool, Manchester and on to Scotland. This will mean a major reduction in journey times to all cities on the network. Phase 2A, opening one year later in 2027, will extend the high speed line from Lichfield as far as a new junction with the WCML south of Crewe – a distance of 58 kilometres (36 miles). The effect of this new section of high speed line will be another major reduction in journey time to the North West and Scotland. The current proposal is for Crewe to be served by classic compatible units that will travel on to Liverpool and Warrington. However, the proposed ‘Crewe Hub’ will introduce a new station on the HS2 line interchanging with a relocated Crewe station – possibly at Basford Hall, south of the town. A decision on this proposal has yet to be made but is expected shortly. 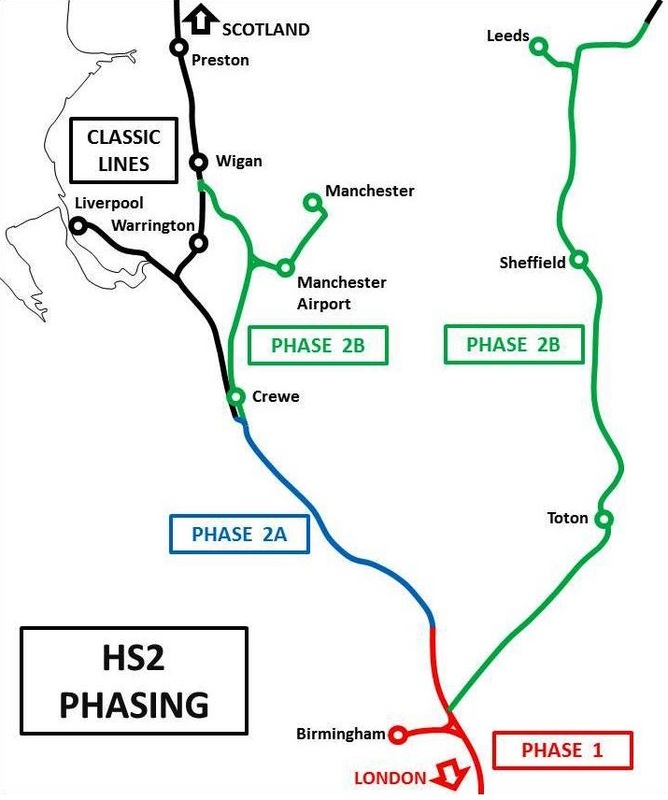 Phase 2B, opening in 2033, will extend the HS2 line north east from Crewe to Manchester via Manchester Airport and construct the ‘eastern arm’ to Leeds via Sheffield and Toton. At this stage, both Manchester and Leeds will be served by dedicated HS2 ‘captive’ trains. Liverpool and destinations further north will continue to be served by classic compatible units. Phase 1 will have a major impact on journey times from Liverpool to London. The present average of 134 minutes will be slashed to 106 minutes. Phase 2A will reduce journey time further – to 92 minutes. This can only be a good thing for the city and city region and so the decision to bring forward HS2 to Crewe is to be welcomed. Phase 2B, by contrast, will offer no journey time improvements to Liverpool but, by introducing dedicated high speed captive services to Manchester and Leeds, will markedly reduce London journey times from both cities. So, Liverpool will find that its main commercial rival, Manchester will be 25 minutes closer to the capital despite enjoying near parity today. Both Manchester and Leeds will also enjoy new high speed services to Birmingham that the lack of a direct link will deny Liverpool. 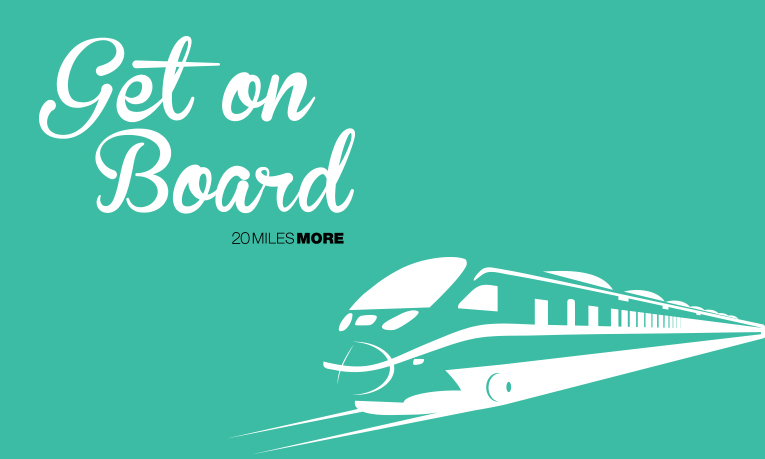 As classic compatible trains will be only 200m long, as opposed to the 400m maximum length of captive trains, there will not be a major increase in passenger capacity on the London route. In fact, should Merseytravel’s aspiration of two hourly 260m long Pendolino trains to London be realised, capacity will actually be reduced on the introduction of HS2! Far from increasing the rail connectivity of Liverpool, the routing of the proposed Phase 2B western arm will not relieve currently congested stretches of track such as between Crewe and Weaver Junction and on the approaches to Lime Street. This will hinder the development of new passenger services from Liverpool and rail freight access to the new Liverpool Superport. The Northern Powerhouse initiative, which seeks to improve connectivity between the major cities of the North has recognised that a new high speed link from Liverpool to Manchester will be important in improving future travel between the two cities as existing lines will not deliver this aspiration. Such a route, by incorporating sections of the proposed HS2 Manchester branch will be achievable at low cost and with minimal environmental intrusion. We at 20 Miles More believe that the only solution is the construction of a dedicated high speed link from Liverpool to HS2. This link will not only give Liverpool a link to London comparable to that enjoyed by other core cities but will also form the first stage of a new trans-North Northern Powerhouse rail link. In so doing, it will ensure that HS2 achieves the government’s intention of rebalancing the economy of the country. 50 Liverpool business leaders and the Vice Chancellors of the City Region’s four Universities are today calling on the leaders of the three main political parties to commit to ensuring the city gets a direct High Speed Rail link as a matter of urgency. Currently neither the HS2 project nor the emerging Transport for the North vision for an East / West HS3 make any commitment to deliver a High Speed rail line into Liverpool. The Open Letter has been co-ordinated by the independent, business-led 20 Miles More campaign and is signed by leading companies in the freight, professional service, life science, tourism, retail and creative industries sectors along with Universities and major business organisations including the North West Business Leadership Team, FSB, Professional Liverpool, Liverpool BID Company and Downtown Liverpool in Business. As the last day of MIPIM in Cannes starts on an “Investing in the Northern Powerhouse” note, the north’s five major cities stand together on the brink of a potentially momentous government investment. 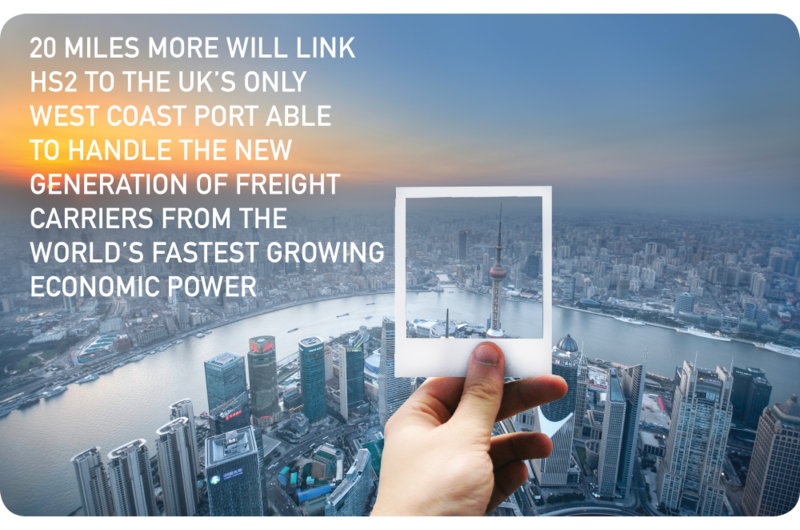 Times look like they could be set to change dramatically for connectivity in the northern regions as Liverpool, Leeds, Manchester, Sheffield and Newcastle late last year launched their One North plan. Under the TransNorth connectivity plan, Liverpool in the west would be connected to the north, south and east by fast and efficient transport, making the Newcastle of tomorrow what second-city Birmingham is to us today, while – should it be given the green light – you can expect to see many more Sheffielders around our city in the years to come. You can also say goodbye to Pacers and traffic jams, and hello to new, revitalised and upgraded city region transport networks that are an asset to businesses from Chester to Barnsley and everywhere inbetween. With HS2 (the government’s railway into London) being launched to much fanfare about “speed” and luxury, to us in the north it was inevitable that people would soon start making the comparison between the time it takes to get to London today (2 hours, give or take) with the sluggish time it takes to get to Newcastle (following recent improvements, 3 hours), and the decrepit nature of many local trains. The “One North” report is the culmination of the collective public irritation that appears to have struck a chord with local political leaders across the region, and subsequently with a government waking up to the reality that perhaps Adonis’ HS2 as initially sketched didn’t quite cut the mustard for many. While some might might ask if it was an error not to prioritise these connections in the first place, the main thing that will matter to people in the north is that they do so now. One North isn’t just an east-west railway line but instead a whole package of infrastructure improvements from the east coast to here in the west, ranging from ports being enabled to help ramp up exports and lower the cost of imports, through to new road interventions, and money ploughed into creating, upgrading and expanding local transport networks. As a major city with a growing SuperPort, and the truly excellent but not-quite-finished Merseyrail network that is yet to reach the city’s airport and eastern suburbs, this really could be something exciting, where – finally – Liverpool gets properly tooled up to perform at its A-game. Liverpool, as we know, is already a pretty impressive city. So too are Manchester, Leeds, Sheffield and Newcastle. And a light bulb seems to have gone on, somewhere, about this string of pearls lacking just a bit of shine and a thread. From 20 Miles More perspective of course the prime excitement comes from the prospect of hooking Liverpool up to the High Speed rail network through an enhanced connection, meaning more faster trains to more destinations – that connectivity meaning business and jobs. Although this isn’t to say that the other aspects on offer are any less exciting or impactful. It is clear from the One North report that both national and local connectivity need to be delivered together to reap maximum results.. Undoubtedly there’ll be some in the city raising an eyebrow at the government’s formation of “Transport for the North”. The city’s businesses and people alike will certainly want to ensure that Liverpool’s interests are promoted and protected, with Merseytravel always having equal and fair access to resources to carry out their proposals, and true local determination as to what those priorities are (such as our city needing better connections to, and around, our wider area including North Wales). That is devolution, after all. As to the prize, all of the north’s major cities currently have economic output below the norm, yet even so today collectively form one of Europe’s largest economies. Just taking the north-west’s Greater Manchester and wider Liverpool City Region, combined they each contribute half towards a £100bn in economic output pumped into the UK economy each year. What can we achieve when we enable each other to outperform? For investors buying into the northern region right now, this represents a strong potential for growth from north to south and east to west. And this is no academic exercise; at the heart of the story behind the north’s present day economic output lie areas – in each and every city – where there is much need for jobs, investment and, fundamentally, for the people born there to have good things to realistically aim for in life. We’ve every incentive to be as invested in this venture emotionally as any business investor has monetarily. This ambitious plan is a work in progress at this very moment, with the cities working with the government aiming for a March reveal. Word is that they’re not quite there yet with an apparent gap between the government’s “Northern Powerhouse” catchphrases and what it will actually commit to delivering. They will surely get there in the end: These investments aren’t just important to the northern cities, but with economic uplift estimates ranging from £67bn to £130bn (depending on how far the investments go) they’re truly valuable to the whole of the UK. At the close of MIPIM Cannes 2015 it’s appropriate to talk about this, there being a clear and direct correlation between the government investing for success in our cities and businesses doing likewise. For a chancellor keen to see receipts go up and structural outgoings go down, the low billions asked for seem more like a bargain.